On the second disc, when "Behind the Magic" is highlighted, press the right arrow and a crown will appear. Press enter, and you will get a brief interview with the first assistant director. 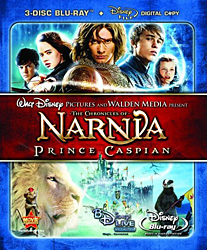 On the second disc, when "Behind the Magic" is highlighted, go down to "Previsualizing Narnia", press the right arrow and a griffin will appear. Press enter, and you will get a one-minute clip of previs and actual filming the charge through Aslan's How. On the second disc, when "Behind the Magic" is highlighted, go down to "Deleted Scenes", press the right arrow twice, and crossed swords will appear. You'll get a short clip about the cast and crew's favorite snack - the toastie. On the second disc, when "Behind the Magic" is highlighted, go down to "Secrets of the Duel", press the right arrow and a shield will appear. Press enter, and you will get a short interview with Will Moseley, Anna Popplewell, and Georgie Henley discussing the saving of Trumpkin from drowning.